school. A year after his release in October 1947, he was married and started a family. I have watched the cable version of hail, hail rock and roll over 50 times and can't get enough of it. Not only do I not care if Chuck Berry has committed these crimes that people write about or care what folks think of him. He has come along with other black singers or broke ground for them to sing all these years. As for all of the generation x bands robbing him of years of popularity do still think, that Chuck Berry can still be the Hiawatha king and melt anyones butter. that his songs would be stolen and made into big hits. After watching his night into the Rock and Roll Hall of Fame did I come to appreciate him more. 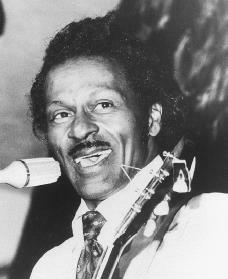 Chuck Berry isn't one of... he is the greatest artist in rock n roll. Thanks for your article - my american english is not so perfect to express my admiration of Chuck!